If you have any questions about the DELICIOUS information page below please contact us. This motor yacht DELICIOUS is a superyacht of well proportioned proportions. This 35 metre (114 foot) luxury yacht was manufactured by Hatteras Yachts in 1993. DELICIOUS used to be the project or yacht name Lady Bj. Superyacht DELICIOUS is a sumptuous yacht that can sleep as many as 6 people on board and has a total of 5 crew members. The firm of naval architecture whom authored this yacht's design work for the yacht is Jack Hargrave. Hatteras/BJ Lowe was responsible for the overall interior design. The yacht's wider design collaboration came from Jack Hargrave. The professional naval architecture plans are the work of Jack Hargrave. Motor Yacht DELICIOUS received her stylish interior designing from the interior design skills of Hatteras/BJ Lowe. In 1993 she was formally launched to triumph in New Bern Nc and post sea trials and finishing touches was afterwards passed on to the yacht owner. Hatteras Yachts completed their new build motor yacht in the United States. The main hull was constructed with composite. The motor yacht superstructure is made predominantly using composite. With a beam of 7.25 metres or 23.8 ft DELICIOUS has moderate size. A shallow draught of 1.95m (6.4ft) determines the amount of overall marinas she can enter into, taking into account their particular characteristics. She had refit maintenance and modification completed by 2007. 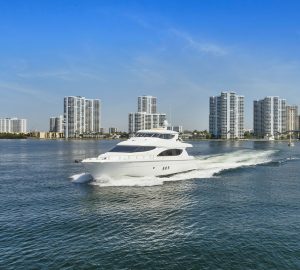 The motor yacht makes use of three reliable CATERPILLAR main engine(s) and can reach a lightning top speed underway of 23 knots. The engine of the ship generates 1250 horse power (or 920 kilowatts). Her total HP is 3750 HP and her total Kilowatts are 2759. Coupled to the DELICIOUS engines are 3sc. For stabalisers she uses Naiad. Concerning bow thrusters she was built with Arcturus. The boat’s energetic cruise speed is 20 knots which makes a range of 900. Bestowing room for a limit of 6 visiting passengers overnighting, the DELICIOUS accommodates them comfortably. She also requires approx 5 expert crew members to maintain and sail. The main engines are three 1250 Horse Power or 920 kW Caterpillar. The Model type is 3412 diesel. Total engine power output 3750 HP /2759 KW. 900 at a speed of 20 knots. Onan 2 times 55 kilowatts, 1 times 30 kilowatts. Lunaire was the outfit which made the A/C on this vessel. She has a grp-teak deck. 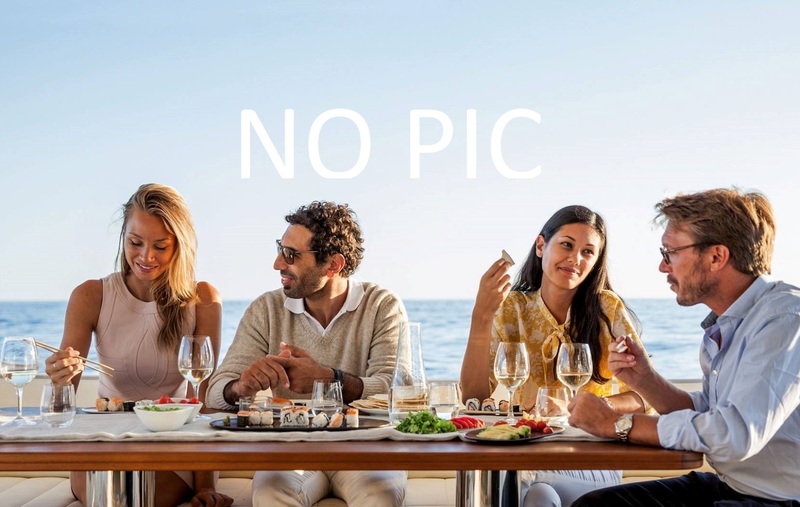 The luxury yacht DELICIOUS displayed on this page is merely informational and she is not necessarily available for yacht charter or for sale, nor is she represented or marketed in anyway by CharterWorld. This web page and the superyacht information contained herein is not contractual. All yacht specifications and informations are displayed in good faith but CharterWorld does not warrant or assume any legal liability or responsibility for the current accuracy, completeness, validity, or usefulness of any superyacht information and/or images displayed. All boat information is subject to change without prior notice and may not be current.